Technology becomes an inevitable part of our life even though we may not aware of its intricacies behind the situation. In our tranquility, electronic gadgets like mobile phone start to act as a friend, guide and philosopher. At this juncture, we should think about the possibility of turning it into a cultural tool by adding our own traditional and cultural expressions. Now onwards, I think, the mobile screen will be the main space where our cultural actions will be displayed properly. Like my earlier attempts 'Mobile Ramayanam', 'Phone novel' and 'Pocket film' this is also a new step in our cultural context. 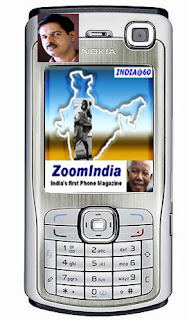 I am very happy in bringing out the first edition of ZoomIndia-India's first Phone Magazine- on the eve of India's 60th anniversary of Independence. For the same reason this issue is dedicated with pleasure to a particular cause ie. India @60. The human value, which enforced and encouraged our creativity all the time is the concept of freedom, for which all the major revolutions took place in human history. The story of Indian independence under the great leadership of Mahatma Gandhi, the father of our nation, got much importance in world history because it gave way to originate the largest democratic country in the world. With all its limitations we are still in the channel of democracy, which represents the supreme state of human freedom. So through the first issue of this Phone Magazine I salute all the freedom fighters within India and abroad for their unforgettable contributions in realizing freedom as we experience it today. Here you can read special studies on world famous freedom fighters like Mahatma Gandhi (India), Martin Luther King Jr. (U.S.A), Nelson Mandela (South Africa), Ken Saro Wiwa (Nigeria) and Aung San Sui Kyi (Burma). Besides, other things like Editorial, Current Affairs, Mobile Phone Technology, Book View and Gadget's Review are also included in the magazine. A lot of pictures showing the memorable events in our freedom struggle have also been included in it. I intend to publish this phone magazine as a half yearly publication. This magazine gives the content like in a print magazine in the form of a Jar file with a size of 450 KB suitable for reading in mobile phones. That means you get a single issue of this Magazine as a single file from the net. It can be stored forever on your mobile and can be read as you please. It is applicable in any Java enabled phone, which has enough space to install the file. For a wider readership and variety I prepared this magazine in English. On the eve of our Independence Day celebrations, I think, it is more suitable to bring out a magazine in English. English language has been working in our country as a linking language by which we could fight against the British as one entity. Today in an age of globalization the same thing is proved again and again.By this edition I wish to bring the spirit of our freedom struggle in our youth, who are the main users of mobile phone technology. Through the presentation of this magazine, Mahatma Gandhi has also entered into Mobile Phone- the new generation digital tool. To some extent, this also fulfils my aim for a change in the fourth screen (Mobile screen) as a cultural space. I think ZoomIndia is the first of its kind from India or abroad. When I searched in the Internet for such a Phone Magazine originated in India or abroad, to be frank, no such file was found. I found only some websites-not Magazines- with the name of Phone Mag or Phone Magazine. But I am conscious about one kind of service available in today's phones called "Mobizine". News items from BBC and CNN are available in so called 'Mobizine'. This has no nature of a magazine as we know today. When you renew the current edition of a Mobizine, the earlier edition will automatically disappear. Actually 'Mobizine' is a news portal working online in GPRS enabled phones. It cannot be called as a Phone Magazine. A real Phone Magazine is a magazine prepared as an independent file to be read only on mobile screen. And if it is a separate file it can be downloaded and transferred freely in many ways like a book. ZoomIndia is such an application file/ magazine made for the mobile phones.